Did you cop the team USA Kobe VII’s today??? The Dallas Mavericks tore apart the LA Lakers during the second round of the playoffs and yesterday was the icing on the cake. Dallas blew out the Lakers and it was an all around team effort. Jason Terry had 32 off the bench and tied the playoff record for most 3’s in a game with 9. 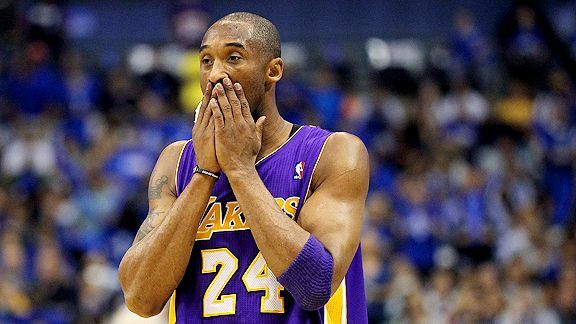 The Lakers Odom and Bynum both got ejected on separate plays. Bynum’s ejected was really uncalled for and deserves a nice fine and suspension. Dallas won 112-86 and moves on to play either the Thunder or Grizzlies in the Western Conference Finals. Was this the end of Phil Jackson’s ERA??? Check out the cool grey colorway of the Nike Zoom Kobe VI’s. Not super crazy but pretty cool. What do you think? The Nike Zoom Kobe VI – Chaos dropped today officially. I really didn’t read too much into them but they are pretty sweet. Get your pair before they sellout because NikeStore already did! Here is the updated release information for the Orange County Nike Zoom Kobe VI. They are set to release 2/12/11 at 3pm EST! Be on it or miss out. Check out the special packaging for the Nike Zoom Kobe VI – China Edition. This pair is probably the second hottest pair to release in the sneaker. Stay tuned for release information. Check out what some NBA players had on their feet yesterday on Christmas. Lebron had the Nike Lebron 8 V2 – Christmas Day, Kobe had the Nike Zoom Kobe VI – Grinch, and Kevin Durant had the Nike Zoom KD III – Christmas Day. I heard Ray Allen had a Christmas pair of Air Jordan XII’s and D-Wade had the Air Jordan 2011’s. The new Nike Trainer 1.2 Mid looks dope! here are pictures of a Kobe and Lebron inspired colorways for the Trainer 1.2 Mids. Personally, I think the Kobe colorway (Lakers colors) looks way better than the Lebron. Look for these to release very soon at retailers. Check out the Nike Zoom Kobe V’s in the infamous Eggplant colorway. The sneaker is hot but this colorway does not excite me much. What do you think? Check out some new colorways for the Nike Zoom Kobe V’s that will be dropping this Holiday 2010 season. The white pair is like a reverse of the “Del Sol’s” that just dropped and the other two pair are wolf grey/black-daring red and ink/metallic silver-black. Look for a November/December release.